The experience of Irish immigrants in Britain has been explored through various publications in recent years. However, these studies have focused primarily on the public arena, where men were dominant, and there is little to tell us of the experience of Irish women in Britain. 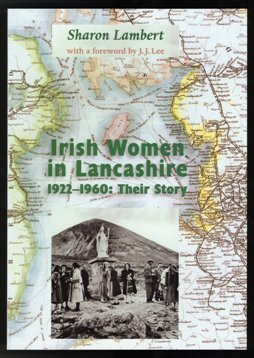 Irish Women in Lancashire explores this subject through the words of 40 `ordinary' Irish women who moved to Britain between 1922 and 1960. Importantly, Sharon Lambert has ensured that the memories of these women are set in the changing social, economic and political context of the period and throughout the book her findings are compared to those of other studies of Irish emigration. Her sensitive approach allows the voices of these women to be heard, perhaps for the first time. Sharon Lambert became a mature student when the youngest of her three sons started school, graduating from Lancaster University with a B.A. and a Ph.D. in history. This book is based on that doctoral thesis. Her father was from Co. Sligo and she has had a lifelong interest in Irish culture, and enjoys playing the accordion at traditional music sessions. Sharon lives with her family in Lancaster, where she teaches community history.